I'm discovering just how labour intensive it is to make up 'proper' circuit boards. Each of the eight temperature sensors is to be mounted on it's own, purpose drawn, circuit board. 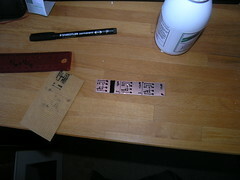 I know I can print out circuits for transfer directly onto a board, but that's the advanced lesson for sometime later. These boards each need 12 holes drilled for the component and attendant wires, plus another two holes for securing the wire, then the whole shooting match soldered up good and proper. This, I'm sure, will not be the last of the tedious Lady Jane jobs that can only really be achieved by me getting my head down & getting on with it. This is not a complaint, mind, the learning and experience is fun. The black line you see on the chart is the engine RPM, or rather a test version of it. After thinking things through, I went for a Hall-effect sensor to measure the revs of the main shaft, as mentioned by anonymous. A magnet glued onto the shaft will create a measurable pulse through the sensor each time the magnet passes it. Something I did not previously know about. The reason for my choice was the concern that any optical sensors would get dirty really quickly and stop working, whereas the magnetic sensor should work regardless of the conditions. That and the optical sensors I got from Maplin were tiny, so adding to my doubts. Using a Hall-effect sensor also gave me the opportunity to play with magnets. I bought a few extra to play with, but am now kicking myself for not also buying the most powerful one I could find just for the laugh of it. In reality only a small magnet is required to be glued somewhere convenient on the main shaft of the engine where it will pass close to the sensor. Seeing the temperatures and RPM charted together like this really motivates me to get this all onto my main engine as soon as possible. The Hall-Effect sensor will need to be bolted onto somewhere solid, but other than that everything else can be glued or clipped into place. I'm looking forward to seeing the figures and charts a live run will produce. Saturday brought some unexpected good weather. So good in fact, that I saw some folks at the marina opposite fire up their on-board barbeque in the evening. Anyway the calm, sunny day provided a perfect opportunity to float the platform across for another load of fresh water for Lady Jane. Seeing as the platform was going across, Fred and I loaded it up with the boat rubbish that has been collecting up both above and below decks for the last few months. This included the remains of the gazebo, which had been neatly stashed - awaiting just such a day. With the fresh water container left filling up alongside at the marina, Fred and I carted a truck load of boat rubbish off to the nearby tip. I do feel vaguely guilty about throwing boat rubbish into the tip. People come along and throw away pristine looking book cases, mattresses, fridges and things, whereas I arrive and tip in the dirtiest, rustiest, most useless stuff you can imagine. Just so as we are clear on this. The boat rubbish is the stuff collected as a result of working on the boat. 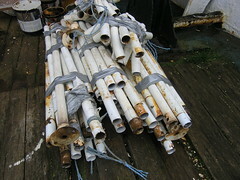 Not the day to day domestic, or household, rubbish which gets routinely thrown away at the marina. 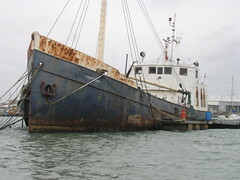 This is the Hamnfjord, a venerable old ex fishing trawler which is moored just down the river from me. I was asked for information on her by Gerben an embarrassingly long time ago, and have only just got around to getting a few pictures of her. There are more images to see. If you are interested, just click on the picture and you will find them. I know some of them are a little blurry but I'm making no apology. It was windy and cold when I went down the river to take these pictures, so no time to hang about making art. Other than the fact that she is there, I know nothing more about her. If anyone has more to add to help Gerben, please feel free. I don't normally stray far from entries related to Lady Jane here, but thought it worthwhile mentioning in relation to that plane crashing into the Hudson, just how skilled the pilot was and how lucky those passengers were with this sobering item at Cargo Law. You have to scroll down a fair way until you get to the pages of statistics produced by Ted Yellman. 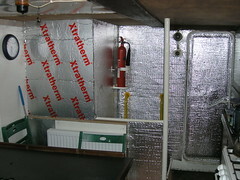 Here's the insulation which has gone into the stern part of the galley. Asides for helping to keep the cold out/heat in, the insulation on the deckhead has also stopped the rain of condensation in the mornings. The deckhead had been painted with anti condensation paint which worked well, up to a point. Beyond that point, it may as well not even be there. Next will be to get insulation onto the walls of the head (the deckhead in there is already done). 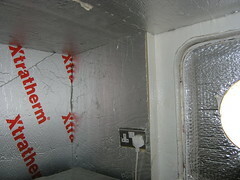 This will entail removing the cistern, so is not quite so straightforward as the other spaces I've insulated. Completing the insulation of the head will be worthwhile though, for obvious reasons. I've been making steady progress on my engine monitor project. Here you see some of the fruits of my labours. Tracking multiple temperatures. The chart shows the steady rise of the temperature in the galley, to a more reasonable level of comfort. You see three temperature traces, all together. That's because all the temperature sensors are still on the same breadboard while I develop and test the thing. The plan is to glue or tape these temperature sensors onto key places related to the main engine, so as to track the overall status of the engine when it is running. The idea being that this is an easy to implement, low impact solution to remote monitoring of the main engine. The system, as it stands, is capable of supporting up to eight temperature sensors. I'm thinking of tracking cooling water in/out, seawater in/out, oil cooler in/out and maybe gearbox and turbo temperatures. I'm pretty pleased with the results so far, with one of the sensors now working off the breadboard, and can tell you that the fridge at home is at least as cold as 7C - at that point I was encouraged to 'get my wires out of the fridge'. I'm guessing that without the rev counter and pressure sensors, which I will work on next, that this setup will be of interest to quite a few people I know. 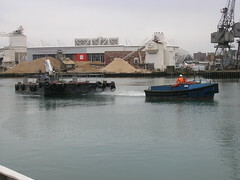 All kinds of weird things seem to get hauled up and down the River Itchen. This a far cry from the mighty tugs to be seen say for example over at Tugster. Though the function of this particular pontoon is obvious, I sometimes wonder about the intended purpose of some of the things I see being pushed or pulled past me, often by very slow, puttering, boats that have obviously seen better days. The galley just got a whole lot warmer. For a while now, I've been mulling over how to reasonably elegantly handle the transition between the woodwork in the accommodation space below and the bare steel surfaces in the galley. In amongst all of this, we've had a bit of a cold spell here in the UK. Nothing like you guys in Canada or the US, obviously. I'm not sure when the inspiration occurred, but inspiration it was. Start with gluing insulation onto the steel, then neatly and permanently secure the whole lot in place with plywood and batterns. In a flurry of activity, Fred and myself set about slapping insulation over sections of steel in the galley. The space age look won't last. I'll get that plywood on as soon as possible, hence providing that transition between the tounge and groove down below and the rest of the galley. The immediate effect of all of this is that the galley is substantially warmer, with less heating. This is another of those occasions when I find myself thinking "why didn't I do that ages ago?". Things are very much taking shape down below. You can now see the full impact that, almost, completing that step there has. 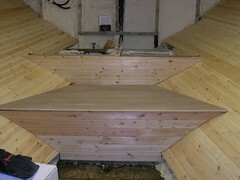 The next step, literally, and the completion of the tongue and groove and ceiling at the stern there will complete the picture. I'm now thinking along the lines of getting help with the next phase, which will be designing how this space will be fitted out. More progress down in the stern accommodation space. Talk about intricate cuts on pieces of ply. Slots needed to be cut to fit the gussets you see there on the left plus the ply curves against the shape of the hull, though it's not that obvious in the picture. Here the job is made just that little bit more interesting by the size of the hatch. The width of the ply I can bring down is limited to two foot at a time. For an idea of size, the completed section you see is comprised of three roughly two by eight foot strips (122*244 cm). The job is made even more challenging by the slope of the hull below the ceiling, as it's impossible to stand below the sections you are working on. Andy crafted a pair of short 'ladders' which you can just see in the bottom right of the picture. This enabled us to balance ourselves more easily to work in those otherwise inaccessible spaces. Here Andy tests the fit of a rather large piece of plywood. Size down there is deceptive. 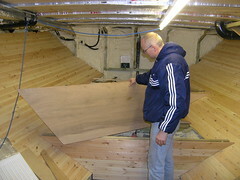 The ply board to cover the section by Andy's knee is just short of eight feet long, at least at the front that is. Fitting the ply required a new toy tool, a planer, to shape the edges of the ply to the slope of the sides there. I've only used a planer once or twice when I was far, far younger and remember how much work it took to scrape off even a thin sliver of wood. With that in mind, no way was I going to buy a manual planer. 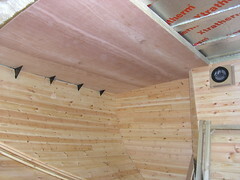 It took us some experimenting and no time at all to chamfer the edges of the ply using my spanking new electric planer. That puppy sure does a good job. It's the way with these things, I know, but now I have an electric planer I'm bound to find all manner of uses for it. I do love these cold, still days. 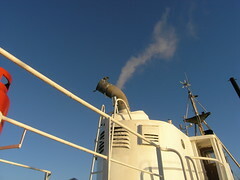 The cold is pretty hard on the system though, especially when working out on deck. I don't know how I'd survive being on board without central heating now. And I don't really want to find out either. Some wind to make power to drive the central heating system would be handy, as the batteries and generator between them are bearing the brunt of this at the moment. What you are looking at is probably the most significant new thing I did for Lady Jane in 2008. In amongst all the wires and things you see is a programmable chip - just visible in the top right hand corner. 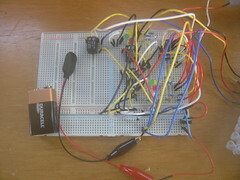 This is a follow on from the PC based battery monitor/remote generator starter project I was working on. It was simply not practical to run a PC to monitor the battery all the time. A chance remark from a friend over at the small marina nearby sent me down the programmable chip route. The result is a simplified version of the previous battery monitor, free of any PC. The only thing I loose is the voltage charting function, which is possible but not implemented. I use combinations of different coloured LED's to show me the battery voltage. With the switch set to monitor, the generator will auto-start when the voltage gets to below 24.1 volts. To complete this project, I'm planning on putting the whole lot onto a PCB (still learning about that part) and packing it neatly into a box with just the switches and LED's showing. For those who care about this sort of stuff, I used a PIC16F88 chip and a 'C' compiler from Sourceboost to produce the code. The Sourceboost forum is a great place to get help with both sample code and advice for the novice. With these programmable chips, I'm learning anything is possible. Next, some way away yet, will be to develop a remote engine monitoring system, to track key temperatures and pressures on my engine, turbo and gearbox. I'm really looking forward to seeing the charting produced from that.